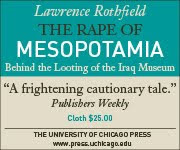 international trafficking of antiquities is, as Deborah Lehr and the Antiquities Coalition have emphasized, racketeering in which the smugglers are mafia-like organizations -- or in this instance, the actual Mafia! high-end artifacts are being proffered, not just cheap pots. It may well be the case that there are distinct smuggling channels, with the more violent ones operating at the higher end where the profit margin is the highest. This is at least a hypothesis to be tested. Given the cost of weapons, and the apparently direct trade of weapons to terrorists in exchange for antiquities to the mafia, it makes sense for higher-end artifacts to be favored currency. securing sites in the absence of central authority requires not SPI-style economic development projects aimed at gaining local buy-in, valuable as such projects are in peacetime situations in countries at peace, but rather the arming of local groups backed by rebel authorities.